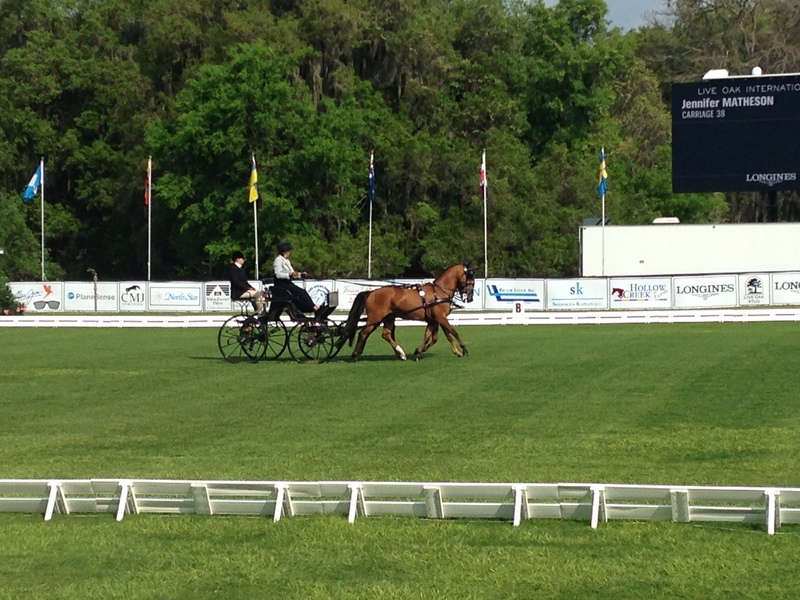 It was Driven Dressage day at Live Oak International in Ocala, FL. Don’t be fooled by the common notion that dressage is boring to watch. Add a cart – and up to 3 extra horses – and you’ve got quite the spectacle. We saw several divisions, including FEI-level Single, Pair and Four-in-Hand for both horses and ponies. The weather was warm and partly sunny – so, perfect for watching a horse show! A major highlight was seeing Chester Weber drive his Four-in-Hand team. They put in an amazing test – easily the best of the day – with a score of 33.44. No other competitor in any division broke into the 30s. It was expected that he would do well, given that he is the defending Live Oak Champion as well as the silver medalist from WEG in Normandy. It was pretty awe-inspiring to watch – check out the video of his final extended trot down centerline. We also saw Allison Stroud and Misdee Wrigley-Miller in the same division. Both put up scores in the 40s. One of Misdee’s horses had an injury that sidelined him, so she was working with an alternate. It was clear that he was a bit more nervous than the other three in the team, but they did admirably and ended up with a 46.25 to land in second place. It’s super fun being affiliated with Horse Radio Network and Horse Nation while I’m here! Everyone knows (and loves) both outlets, and it’s fun to chat with people. We met some great vendors, including She Rides I Pay, BeneFab and Hats by Katie (incidentally, Katie herself is competing in the FEI Pair Pony division this week, and had a score of 52.61 in the dressage). Watch for an update on more of the style and products we’re finding here. I’m trying to keep a close watch on my budget while I’m here…but it’s getting very hard! Tomorrow will be Intermediate Dressage, followed by jumpers. I’m so excited to see who will be here! Tomorrow will feature the 1.35m Power & Speed class and the 1.4m Welcome Stake. Can. Not. Wait! Wow! Even their legs are insync!! I know! So cool. You can just see why Chester Weber is one of the best in the world.